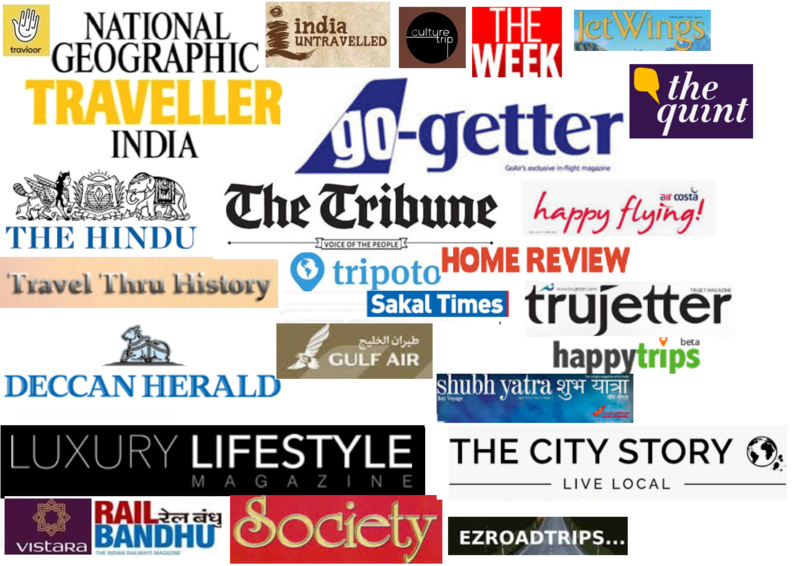 When you visit a world famous heritage site like Hampi where there is so much to see and do, there are high chances that your are overwhelmed and miss out on nearby destinations that are equally attractive. Anegundi, a quaint village located in the Gangavathi taluk of Koppal district in Karnataka falls into this category. 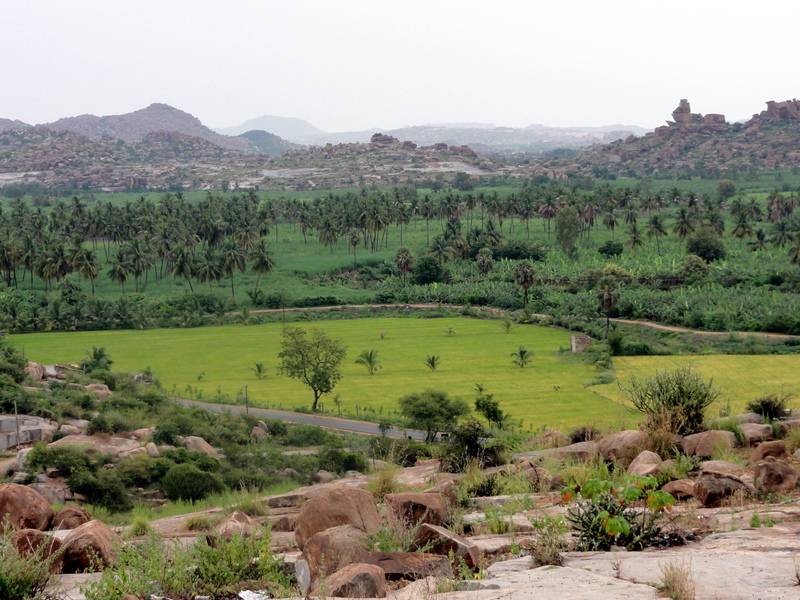 Located just off Hampi, across the Tungabhadra river, the village is said to be one of the oldest plateaus on the planet! It is no surprise that it holds many a mythological treasure and is believed to be the monkey kingdom of Kishkindha that is mentioned in the epic Ramayana. 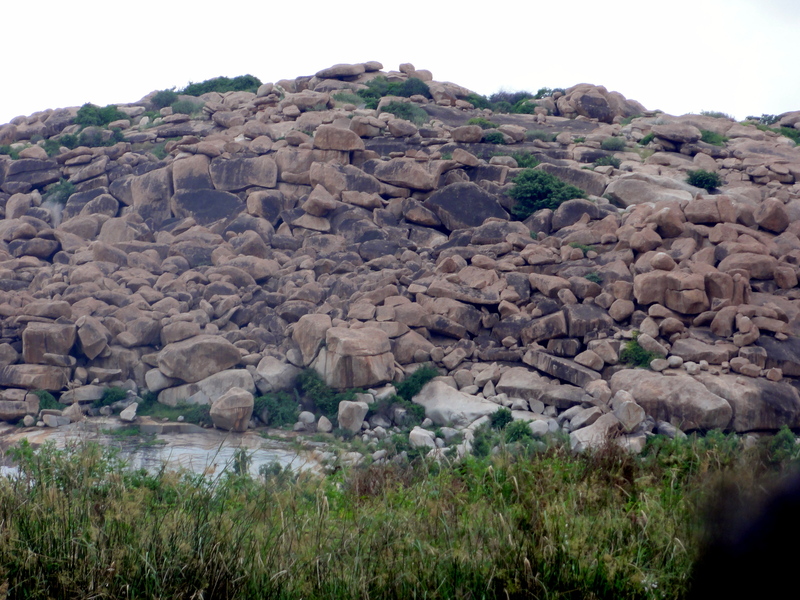 In fact, the nearby hillock of Anjanadri is supposed to be the birth place of Lord Hanuman. Anegundi in Kannada translates into “elephant pit”. 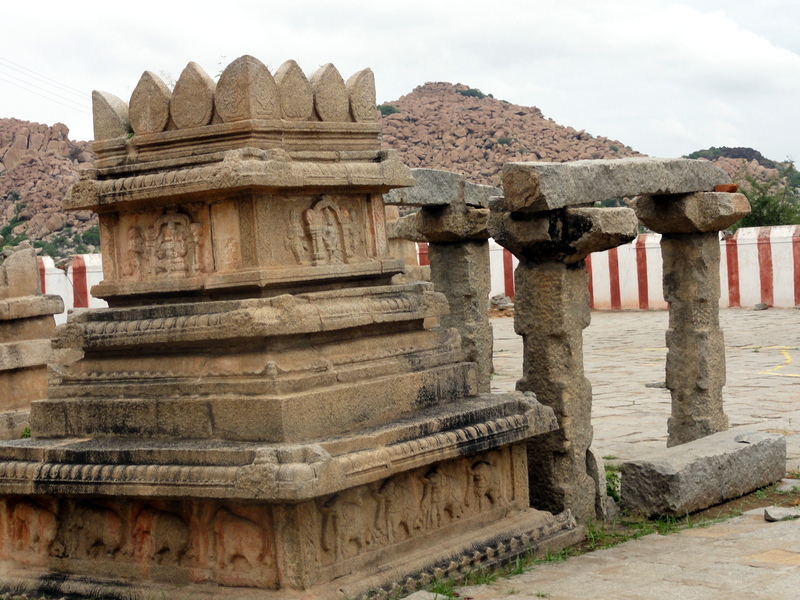 Historically, this village was one of the administrative centers of the Vijayanagar kingdom where the elephants of the Vijayanagar kings were kept. The picturesque village characterized by boulder hills, paddy and banana fields is home to a number of ancient temples and historically significant sites. While in this mystical village, we visited the famous “Navabrindavanam” which is a holy place that houses the tombs or ‘samadhis’ of the nine famous saints who were the followers of Sri Madhavacharya. 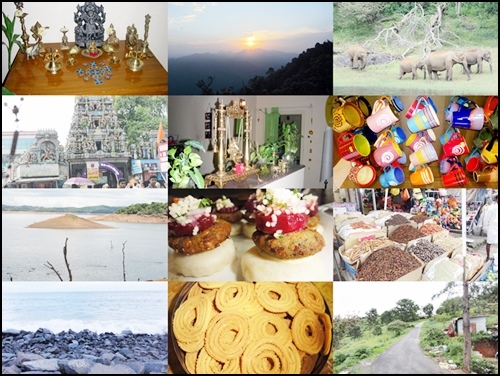 The place itself is a tiny yet beautiful island located slightly uphill and is accessible by a short coracle or boat ride across the river from Anegundi. The tombs are grouped together in a rough circular pattern and there is a surrounding yellow line indicating pilgrims walk outside this boundary. 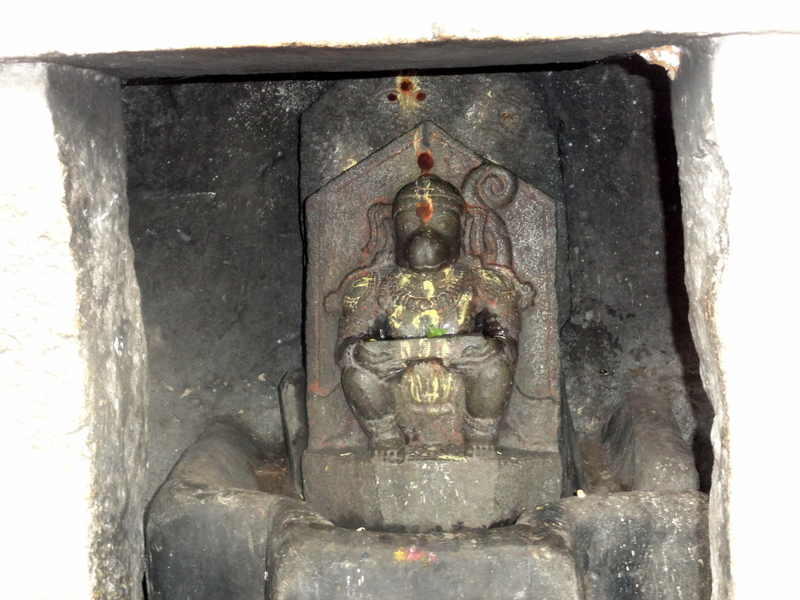 The oldest samadhi is of Sri Padmanabha Tirtha, who attained samadhi in the year 1324 A.D. The samadhi of one of the most famous Madhawa saints, Sri Vyasaraja Thirtha is also one among the nine. This sacred vicinity also houses shrines of Lord Ranganatha, Lord Hanuman as well as a cave where Prahalada is believed to have worshipped. There is another idol of Lord Hanuman known as the “Avataratraya Anjaneya” which has high religious significance as it believed to be Hanuman, Bheema and Madhvacharya in one form. All the three are incidentally believed to be the incarnation of Vayu or the God of Wind. 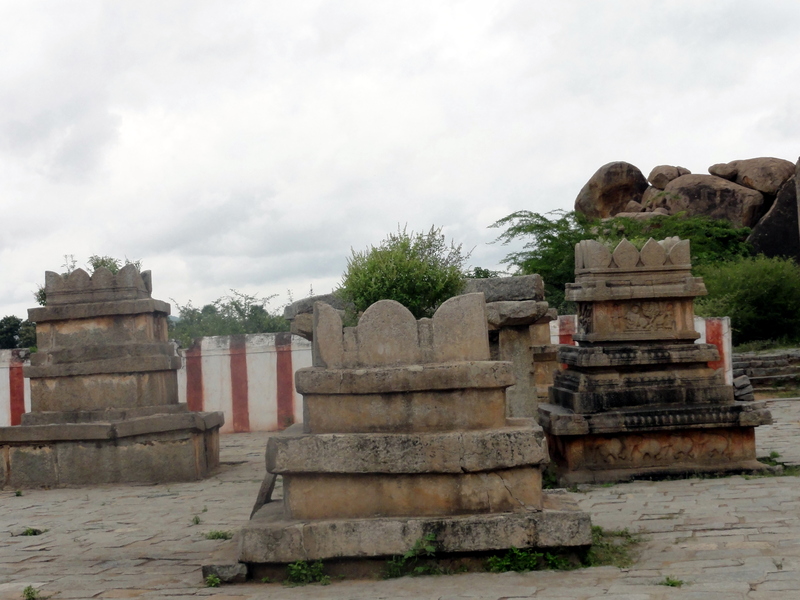 Apart from the Navabrindavanam, Anegundi is a lots of interesting sites to visit including the Anegundi fort, Pampa Sarovar, Durga temple, Gagan Palace and prehistoric settlement called Onake Kindi. It is also a great place to unwind, laze around the lush green paddy fields or relax while watching the tributaries of the river dance its way on the numerous boulders of the terrain. It is best visited along with Hampi and thanks to the efforts of The Kishkinda Trust (TKT) , this village is now a site of heritage conservation where sustainable rural tourism has been implemented very successfully.